DVD: Lusomundo (Portugal). Language: Portuguese with English Subtitles. Ratio: 16:9. Length: 101.00. Region: 2. Having played successfully at countless festivals – it was nominated for Discovery of the Year at the European Film awards, won the Prix Regards Jeune award at Cannes and stands as Portugal’s Oscar submission – Alice is released on DVD within months of teenager Natascha Kampusch’s escape from her captor of eight years. Such unusual timing lends a disconcerting counterpoint to Marco Martins’ début feature, which documents a father’s meticulous and compulsive search for his missing daughter. Like Lodge Kerrigan’s similarly eponymous Keane (2004), Alice isn’t about the circumstances of the abduction, which remain unseen throughout, or arguably even the search itself, but is more affectingly focused of the nature of grief itself. Unlike in Kerrigan’s film, however, there is no question of Alice’s existence. Her life informs everything on screen. The coat she wore on the day she disappeared seems to have stained the cinematography a monochrome blue, and almost every line of dialogue is spoken with her in mind. 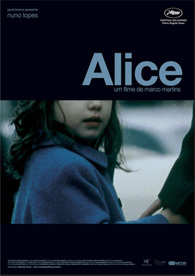 “Alice is a film about absence”, explains Martins. This is evident from the first probing pans that chart the contours of Alice’s sleeping parents. Heavy repetitive breathing dominates the soundtrack – their grief has forced them into wordless resignation. In addition to their daughter, they have, for all intents and purposes, also lost themselves. Alice’s mother Luisa (Beatriz Batarda) is medicated, almost bed-ridden and emotionally numb. A torrent of emotion, glimpsed in flashback, has been reduced to a solitary tear shed to commemorate her missing daughter’s fourth birthday. Mário, played with impressive subtlety by Nuno Lopes, obsessively retraces the steps he took on the day he lost his daughter: buying an origami dog on the way to school and later delivering the dry-cleaning. Martins emphasises the divergent paths they have taken during an extremely uncomfortable dinner scene. Mário and Luisa rarely share the frame and are instead captured in individual close-ups, emphasising physical proximity while revealing their emotional isolation. Additionally, Mário routinely distributes missing posters and maintains an elaborate network of high-angle DV surveillance cameras. Some stand weather-beaten on borrowed balconies, while others peer unperturbed through second-story windows. The tapes reveal a city in transit, recorded by a father in stasis. On the contrary, the reason for Mário’s search is revealed in a second-act flashback. Surrounded by heavy media interest, Mário is called upon to identify a girl found shortly after his daughter’s disappearance. She isn’t Alice. Mário stumbles, crushed, into the streets and eventually finds himself kneeled before an altar of television sets displayed in a store window, each frame reflecting his image, and indeed his loss, in a flood of blue light. Sadly, the scene is overplayed as epiphany – all too clearly identifying the genesis of Mário’s search methods. Underscored by the film’s melancholy piano theme, it is as devoid of subtlety as the bat wing that grazed Bruce Wayne’s window. What should have remained simply a suggestion of the duality of Mário’s loss is instead wasted in a moment of hackneyed clarity. Similarly, Martins’ frequently draws parallels between footage of Mário’s search and the surveillance tapes themselves. Presumably, the similarities are intended to introduce subjectivity to the film’s central premise through the use of film-within-film devices. Martins’ states: “We don’t know if the scenes are real … or merely figments of his imagination”, suggesting as much. In truth, the technique doesn’t cast any doubt on the validity of the footage or Mário himself. In light of Michael Haneke’s Caché (Hidden, 2005), which masterfully blends mediums and viewpoints, this shortcoming is doubly disappointing. These criticisms aside, Alice remains an affecting, simply told character study. Although the narrative is straightforward, the structure is dramatically sound and the film’s restraint is pleasingly free from clichéd catharsis. As such, it is perhaps unfair to draw comparisons with Hidden, which in many respects stands as a deconstruction of the same. A career in advertising has allowed Matins to develop a deft technical palette and, based solely on Alice, it is fair to assume that his aspirations are far removed from those of Haneke. Testament to this, Martins successfully weaves a recurring motif of repetition throughout the film, not only in Mário’s actions, but also through composition and movement. A particularly striking example arises as Mário watches his wife taking part in a swimming exercise. Unusually, the scene is shot in close-up, ensuring the event as a whole remains elusively unseen. Instead, individual actions are emphasised through their fragmentary presentation, offering a revelatory insight into Mário’s life that is similarly made up of fractured moments. During the course of the film, Mário routinely inhabits an emotional limbo, lost somewhere between hope, desperation and acceptance. By the film’s conclusion, his search has come to an end and he appears to have assumed the latter. A final reel revelation, however, again places the audience in Mário’s mindset, casting doubt on our own formulations of Alice’s fate. True to the motif of repetition, the cycle remains perilously close to starting over. Although World Cinema distribution has increased dramatically since the advent of DVD, Alice hints at a wealth of quality European film still struggling to find a wider audience. Given Alice’s festival successes, it is commendable that Lusomundo has included English subtitles for the main feature; it’s a disappointment, however, that the supplementary material remains untranslated. The exhibition opportunities heralded by the advent of DVD truly are staggering, even if most distributors aren’t yet fully exploring them.